Permoser was the leading Late Baroque sculptor in Dresden, where he helped to create the Zwinger. He was trained in Salzburg c. 1663 before going to Italy for fourteen years. He arrived there c. 1675 and went to Venice, Rome, Florence and other cities; in Florence he carved the faade of the S. Gaetano (c. 1684) and worked for the Grand Duke Cosimo III, who tried to secure him as Court Sculptor. 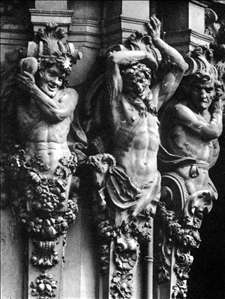 Permoser, however, went to Dresden as Court Sculptor in 1689. He spent the rest of his life there, except for several trips to Berlin, a visit to Italy in 1697/98 and another in 1725, when, at the age of 74, he walked to Rome. He returned in 1728. 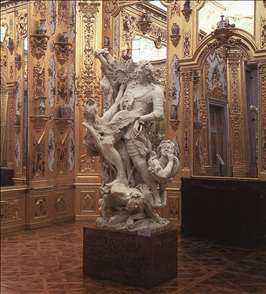 As might be expected from his strong Italian leanings, he was much influenced by Bernini, but, like the other Northerners Puget, Donner and Schlter, he introduced an element of restrained classicism - though this is not very obvious in his most famous work, the Apotheosis of Prince Eugene (1718-21, Vienna). Most of his Dresden works were damaged in 1945, but have been restored. See more details about "Atlante"
See more details about "Apotheosis of Prince Eugene"
See more details about "Supporting figures"